Grassroots organizing is the key to building a movement, and much of it today is done online. Connections made through social media sites such as Facebook and Twitter bring supporters to rallies, and dozens of online sites help politicians and activists manage vast amounts of data, disseminate their message and connect with supporters. Several candidates in last year’s French presidential election turned to a U.S.-based company called NationBuilder for digital tools to manage their outreach. The election’s surprise winner, 39-year-old Emmanuel Macron, did not, but he later turned to the company to build a legislative majority in the National Assembly. His field of candidates in the legislative election in June 2017 included many political novices, but Macron gained a majority of the assembly’s 577 seats, securing 350 seats for his La Republique En Marche! party with coalition partner Mouvement Democrate. The company is one of dozens of sources for the digital tools that activists use. Others include the open-source CiviCRM for nonprofit management and the petition-writing site Change.org. NationBuilder says it attracts people across the political spectrum, from Republicans in Maryland and several southern U.S. states to Jagmeet Singh, the newly elected leader of Canada’s left-leaning New Democratic Party. A Sikh, Singh is the first member of an ethnic minority group to serve as permanent leader of a major Canadian party. 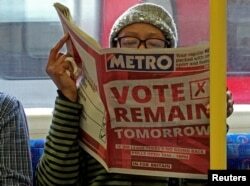 FILE - A woman reads a newspaper on the underground in London with a 'vote remain' advert for the BREXIT referendum, Britain, June 22, 2016. The debate surrounding Brexit, the 2016 vote to withdraw Britain from the European Union, spurred activists on the “remain” side. They used NationBuilder to target supporters, sending targeted emails to supporters in specific parts of the country “to set up a campaign group or support one that’s already there, or promote an action that’s happening locally,” said James MacCleary, campaign director for the European Movement UK. “It gives an ability to be very flexible with our data and get away from global email blasts,” he said. The group is pressing for a national referendum on the final Brexit agreement. For any organization or cause, supporters receive targeted emails that help to build relationships, according to Ryan Vaillancourt, director of sales enablement at NationBuilder. With a presence in more than 100 countries, the company adapts to local needs in places like Africa, where “they’re not about long email lists and long newsletters,” said Toni Cowan-Brown, NationBuilder’s vice president for European Business Development. “They want to be able to communicate with people on their smartphones because that’s the biggest and richest technology source that they have right now,” she said. From political parties to nonprofits, promoting a cause or building a movement are all about people, and the tools to connect and motivate them, these tech developers say, are found today online.